After 20 years coping with psychosis, Matt Barrell has drawn on his experiences and perspectives to depict what he views as the “nightmare scenarios” of mental health. 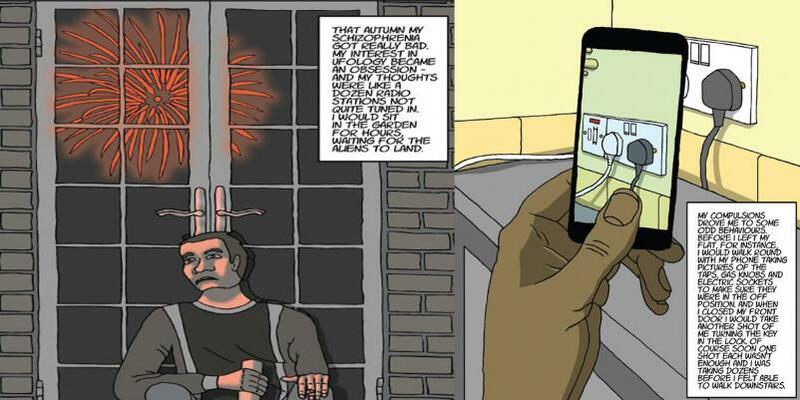 Over 24 colour pages, Matt, a former magazine sub-editor, has produced a graphic novel-style booklet illustrating a range of different mental health conditions. Each page offers stark portrayals of issues including Obsessive Compulsive Disorder, depression, schizophrenia, suicidal thoughts, psychosis, dementia, drugs abuse, alcoholism and gender identity. The collection of drawings, entitled “Nightmare Scenarios” and examples of which can be seen at www.mattbarrell.co.uk, took about nine months to compile and was intended as a personal perspective, as well as an outlet for Matt’s developing interest in art and design. Matt, 52, of Drayton Park, Islington, said: “This has been a personal project to motivate me to keep drawing and as someone with mental health issues it seemed logical to draw what I know about. “When my psychosis was at its worst, I felt some of the issues depicted in the book would come back to revisit me. Matt, who has completed a foundation course in art and design, became unwell in the mid-90s, resulting in three separate psychiatric admissions. In more recent years, as part of the support he has received from C&I, he has attended art therapy courses and counselling offered by the Trust at Isledon Road Resource Centre, Holloway. As his collection developed, Matt decided to self-finance production of 50 copies of the booklet. His counsellor, Diane Frazer, feels the experience has been cathartic for Matt, and also helps dispel myths around mental health issues. • The book is available via PayPal for £7.90 (Inc p&p) from mattbarrell@blueyonder.co.uk.